(29883B):Blue 2 door safety cabinet - Acid 30 Gallon 44" x 43" x 18". (29883P):Green 2 door safety cabinet - pesticide 30 Gallon 44" x 43" x 18". (29883R):Red 2 door safety cabinet - flammable 30 Gallon 44" x 43" x 18". (29883Y):Yellow 2 door safety cabinet - flammable 30 Gallon 44" x 43" x 18". (29884B):Blue 2 door safety cabinet - Acid 45 Gallon 65" x 43" x 18". (29884P):Green 2 door safety cabinet - pesticide 45 Gallon65" x 43" x 18". (29884R):Red 2 door safety cabinet - flammable 45 Gallon 65" x 43" x 18". 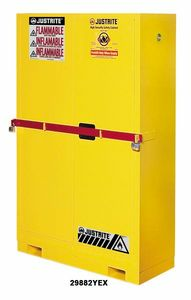 (29884Y):Yellow 2 door safety cabinet - flammable 45 170 65 x 43 x 18". Safely store and protect costly fuels or chemicals from tampering or theft. Security system includes .25" x 2" steel bar stock, high visibility barrier bar secured across both doors to deter prying. Crossbar is firmly supported by two brackets welded across the front of the cabinet doors and interlocks onto two sidewall brackets. Padlock lugs on crossbar and side bar channel are located on each side of the cabinet, provide double layered steel strength and accept No. 5 Master Locks. Set of two keyed-alike locks are sold separately. Lockable doors with Sure-Grip handle are designed with a three-point latch for an extra measure of security. Manual closing door style self-latches for maximum protection under fire conditions. High visibility warning labels promote proper usage while contrasting color crossbar enables security checks even from a distance. Built to OSHA and NFPA specifications, fire resistant design includes double-walled, 18-gauge all welded construction with 1.5" of insulating air space. Additional safety features include dual vents with flame arresters, 2" leaktight sump to capture spills, and grounding connector. Adjustable shelves maximize capacity for a variety of containers. High Security Safety Cabinets with built-in forklift pockets make it easy to relocate when empty. The forklift pockets maintain cabinet integrity and are equipped with four leveling feet to assure stability on uneven surfaces. High Security Safety Cabinets without forklift pockets for stationary applications are also available in a choice of manual or self-close doors. All cabinets carry an exclusive 10-year limited warranty when used indoors.